It was grand! 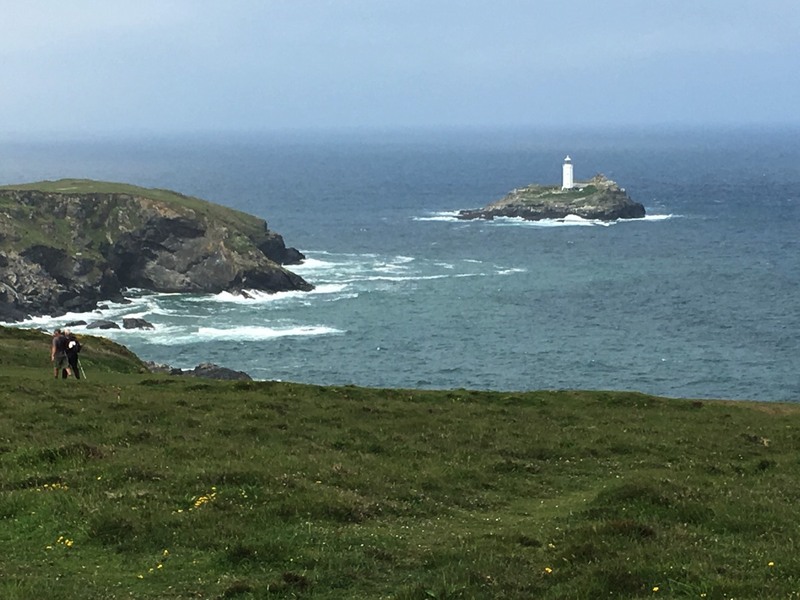 Our 2018, 275 mile walk on the Cornwall segment of the English Coast Path was a stellar experience. Last year’s 170 mile, southernly trek from Minehead to Port Isaac on the west coast rated as a “so-so” in my book, but Port Isaac to southern most England and then back north to Plymouth on the English Channel, was stunning. Now that’s a satisfying ocean view. I have a strong literal side and when they say "Coast Path", I expect to see the ocean, which wasn’t the case much of the time in 2017. Too many hours were spent inland battling humid, thick, hedgerow scrub and endlessly trudging up and down long, steep, mini-gorges water-cut through pastureland. Our 2018 walk was much more of an ocean experience even though we did some of the same trudging as last year. We were never far from the sounds or sights of the ocean and dipped down the mini-gorges to the sand multiple times a day. The experience of the sea was more intense in 2018 than 2017 and of the culture as well. I’ve preferred cyclotouring to walking because even if the scenery is a bit dull, it generally changes at about the same pace as my mind works, decreasing the boredom of exertion. Then I discovered that hiking above tree line often added the visual stimulation I needed to stay engaged. But last year’s walk in the English countryside didn’t satisfy either of our brains and we resorted to hours of audio entertainment in the form of books and language lessons to keep sane. In 2018, we eagerly listened when there were long stretches of steady footing, but we didn’t need the distraction to survive mentally. We walked everyday for 20 days with one light day strolling in a delightful historic garden with our British friends and making a dash to the next village’s market before hand. Most days were in the 14-15 mile range, which tended to be a tad long for the conditions. A few days early on, we could maintain a 3 mph pace for the entire moving time, but other days we were happy if we made 2 mph. The trail conditions varied tremendously. We could be speeding along on the paved seaside promenade of a village or on open, closely cut pasture land or be crawling over boulder clutter on our hands wondering if we really were on the path. Sand was slow going, as were the dunes with some stabilizing vegetation. Muddy patches and creeks required care whereas endless flights of rustic steps demanded discipline to keep at them, up or down. Too few signs in critical places slowed us down. We were likely never over about 1000’ above sea level but we logged over 40,000’ of elevation gain. A less common type of stile. The time, money, and burden of jet lag when traveling to Europe for the summer have kept us looking for venues from which to extend our travels beyond the 90 days we are allowed on the continent. England, with independent visa restrictions, is one such option, but we’d been fulfilled with our prior travels as tourists there. But learning about the Coast Path and other national trails made us reconsider. May is always a little difficult for us weather-wise for hiking: it’s too hot in the desert SW and snow is still lingering in the mountains in the north and the south. England is risky because of the marine rain threat but Bill selected a southerly route for our sample tour last year. Storms whipped up at the end of our 13 day walk in 2017, so we settled for walking on the best 11 days, which was good enough. The weather this year however was exceptional and we didn’t need anyone to tell us that was the case. 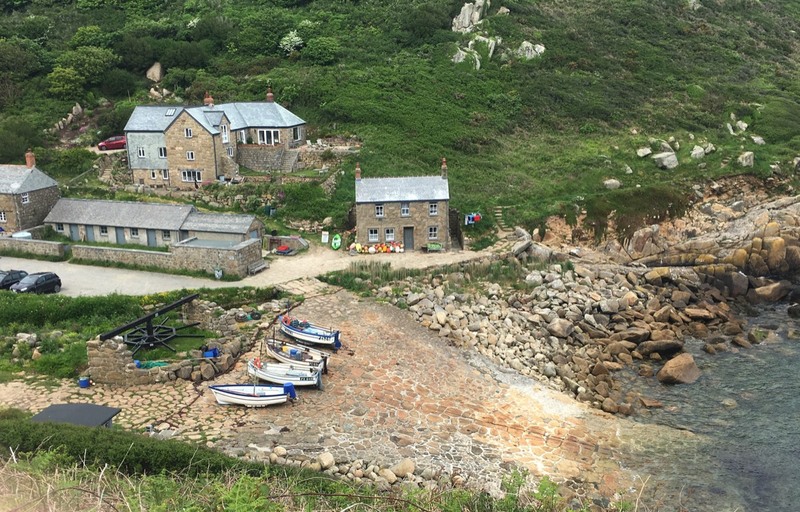 The other draw for doing the Coast Path was to condition our bodies for greater durability. In late 2015 and into 2016, we discovered while in the Grand Canyon, that we had tremendously increased our exercise capacity but hadn’t known or been utilizing it. When we first tried doing the 20 mile, 5,000’ elevation hikes down to Phantom Ranch and back or going Rim to Rim, we did so well within our ability. We were stunned. So the next issue was to make sure our soft tissues, like muscles, tendons, and ligaments, were durable enough for the strain. The food scarcity, as in few and small food markets, on the relatively remote Coast Path made it compelling as a through hike, a hike-every-day hike, rather than a series of intermittent day hikes like we do elsewhere. The goal hadn’t been to do a 100 mile week but instead to a 10+ mile hike every day for the durability training. The several companies providing luggage transfer services are a huge asset for this venue. They are what make this walk possible for us. Most of the walkers are more local and do the path as a series of day hikes, rather than as a through hike like we do. We however couldn’t tack this Coast Walk on to our Italian Dolomites trip without the luggage transfer service. We each had 50 lb suitcases filled with supplies for our subsequent 3 months in the Alps. Stashing our suitcases and carrying all of our supplies for 3 weeks of walking just wasn’t an option for us, nor was bringing less gear. One of a number of ferries we took as a part of the official route. My suitcase always has extras like 2 smoked salmon fillets, dehydrated spinach, and freeze-dried chicken for our week-long stay at Passo Sella in late June where there are no food stores for miles around. Then there was the new 4 quart stainless steel pot for use at an apartment in Selva where we spend a total of 3 weeks. The lovely apartment’s pots are all round-bottomed, making it a nightmare to cook on the ceramic stove top. The pot will permanently stay with our gear stowed with the bikes, so it was a one-way trip for it. We each brought an extra pair of half-worn out shoes to ensure that we had good tread for England and new tread for Italy. And we each had our new ISM split bike saddles, which like the pot, would remain in Italy. In addition, Bill had his ever-changing mix of new bike parts for maintaining our 2nd pair of bikes that now reside in Italy. We also had an assortment of warmer clothes and cycling gear for our time in the Alps. The luggage service was flawless both years. Bill sends them a copy of our itinerary with our pre-booked accommodation details. We ready our bags by 9 am for pick up and they are delivered to our next stop by 5 that evening. It’s often only a few miles between locations by the main road, unlike when walking along the coast, so it’s not an ordeal at their end. But they call each host to coordinate both the drop-offs and pick-ups and use a fleet of local drivers. It’s seamless from our perspective. We carry a small hand scale to ‘make weight’ every morning so as not to exceed their 25 kg limit. Our sandals were nice for the low tide crossing - no ferry needed for us today. Cornwall is the county occupying the southern most tip of England where we spent most of our time this year and has historically been a backwater. Neglected by the north, the resentment still lingers, though none of it was directed towards us. We consistently felt warmly received—more so than elsewhere in England in the past. Perhaps we were from far enough away to register as traveler-friend rather than domestic foe. 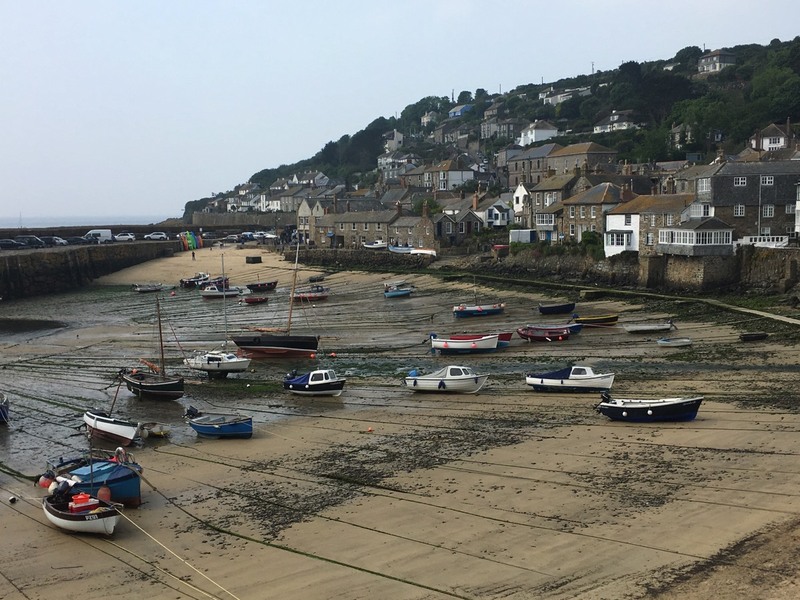 Visitors from other parts of England were quick to say with a twinge of resentment “That’s Cornwall for you,” an expression that was clearly loaded with deeper meaning that we understood. Their black and white regional flag was everywhere. Cornwall definitely has growing pains. The poorest region in the country, it received the most subsidies from England’s affiliation with the EU and yet were among the strongest supporters of Brexit, apparently seeing no contradiction. A drive-to beach with sports rentals. The booming tourist industry brings visitors like us in droves as well as city folk ready to make a second career as innkeepers. The locals in many charming little coves and harbors have been priced-out of their homes by those with the cash to gentrify the area. Some communities are constructing low cost housing specifically for the displaced, indigenous population. Our US Pacific NW beach culture is a stoic, solitary affair most any time of year with a long tradition of visitors bundling up against the wet and wind to get their walk on the beach. Being barefoot while wearing a heavy jacket and hood is a common experience. 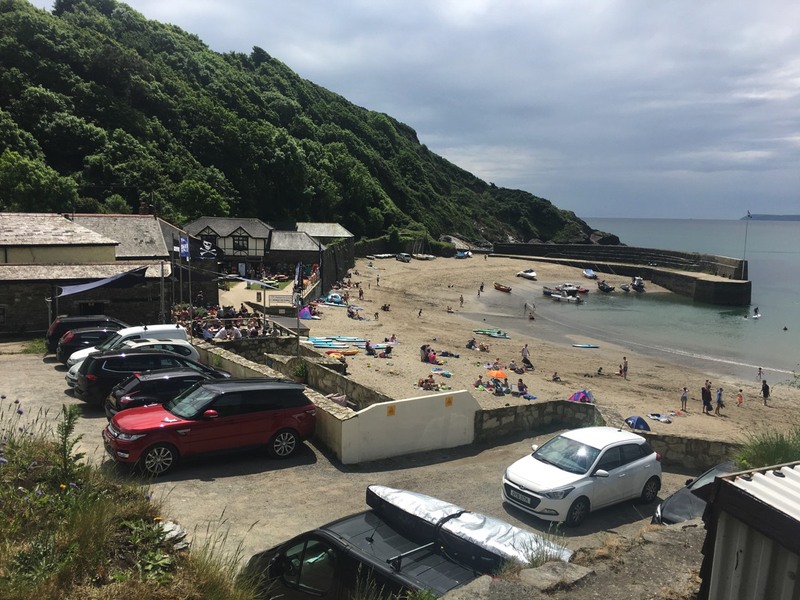 In Cornwall, smiling families in bathing suits loaded with gear swarmed like invading hoards to the beaches and retailers abounded to fulfill their fantasies. We’d walk for hours in solitude on the Coast Path, then take another precipitous dive down a dirt slope to land on a buzzing beach scene. The tiniest beaches would have mobile vendors, with at least an ice cream truck. The next level would include a small wooden building for sports equipment rental. And then of course, there where entire communities or cities built around the cove and beach. The Cornwall beaches were sort of a sports Disneyland. Rental rates often started for as little as 2 hours and you could play with someone else’s gear for less than $20. Common options were surf boards, body boards, kayaks, and stand-up paddle boards. Wet suits often were included in the price and lessons were readily available. The operations targeted beginners and the people loved it. Even on overcast drizzly days, people would be in the water though the vendors usually didn’t show up. I delight in being around people when they are being active outdoors and I always enjoyed our brief encounters with the colorful fray of beachgoers. Trying stand-up paddle boarding is on my short bucket list. Down to the sea again. We literally freaked-out on last year’s walk when we discovered we were being preyed upon by ticks. We came unprepared and avoiding ticks and nightly tick inspections of our bodies became a major distraction, but not so this year. This year we arrived with an ample supply of Autan, a European product of 20% picaridin, which is safer and superior to DEET. Coincidentally, we’d discovered Bedrock sandals with Vibram soles over the winter, sandals that can easily be worn with socks. To support our day-after-day hiking, we generally change shoes at mid-day--being able to wear sandals allowed us to break-up ’shoe monotony’ for our hard working feet. So with our pants tucked into thin, tightly knitted socks and our lower legs also slathered with Autan, we felt armored against the Lyme-disease carrying buggers this year. A spritz around our necks and wrists protected us when the vegetation was taller than us. We always wear long pants and long sleeves for sun protection, so we were off to a good start for repelling ticks. The full cover-up was unpleasant in the often high humidity on the trails but was the envy of many when we were all battling through nettles and other irritating vegetation. Were ticks a significant problem this year? We don’t really know. We believe that none burrowed into our skin but we know we were in a typically high tick infestation area. Ticks love wet grass and our grass encounters were usually in dry conditions. We did however see a single tick. We’d come in for the night, Bill sat on the white duvet cover to remove his shoes, and when he got up, there was an adult tick crawling on the linens. No doubt he brought it in on his clothes. Why did it happen to come off then and how many others did we transport over the nearly 3 weeks, are unanswered questions. We do know that we’ll use the same deflection strategy next year for our peace of mind. 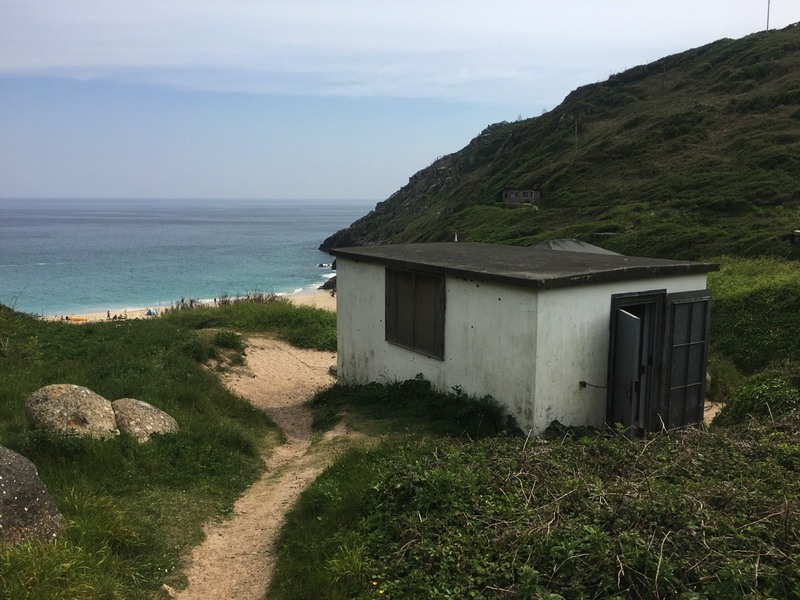 This modest Cable House at Porthcurno was built in 1929. At the start of WWII, it housed the termination of 14 telegraph cables & was the largest & most important in the world. We were extremely lucky with the weather and we knew it. 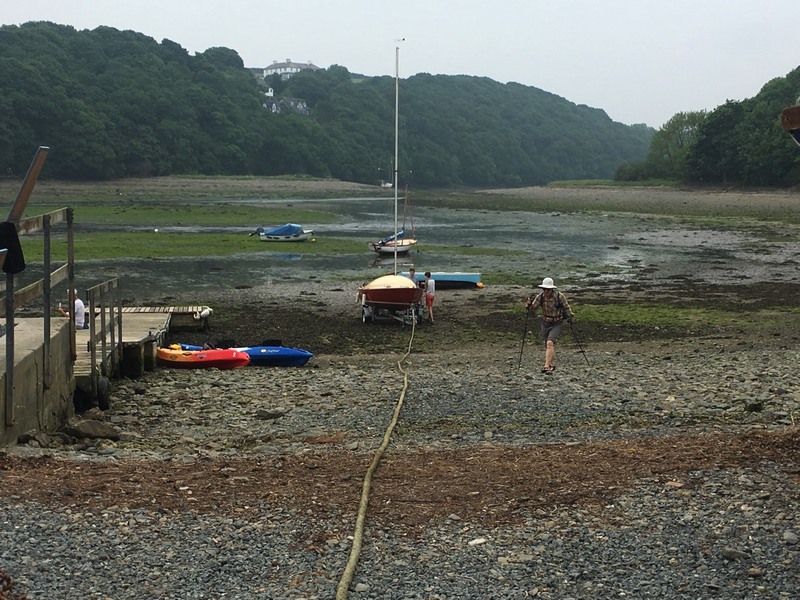 We flew into Newquay from London on a cold, wet, windy day and in the haze of jet lag we asked ourselves “Oh my gosh, what have we gotten ourselves into now?” However, the next 13 days were largely dry and sunny. We had an half an hour of drizzle at the end of one day and the same the next morning, but the rest of those days were dry. There was plenty of rain in the forecast that didn’t happen. We reveled in the luxury of making our epic walk during an exceptional streak of good weather. Day 14 however, was nasty. A cold, wet, windy day of which we spent too much of the middle 2 hours out in the weather waiting for, or riding in, a ferry. 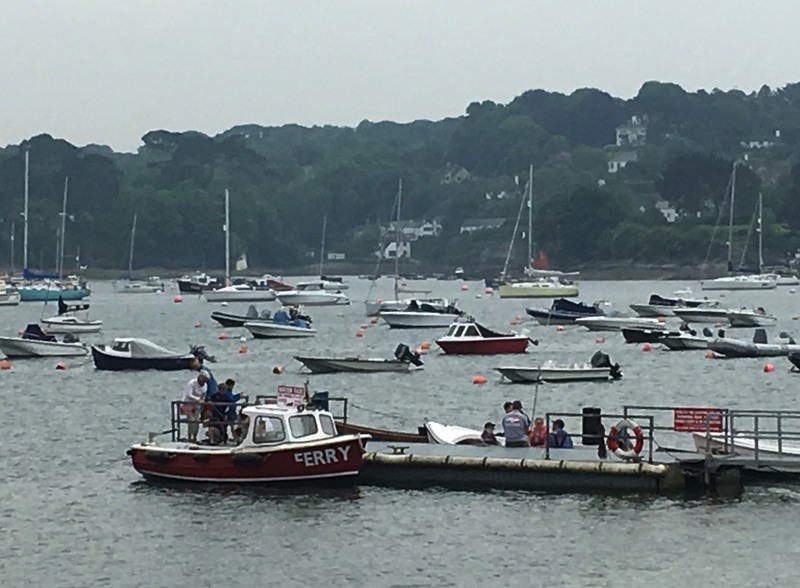 One ferry was a large outboard motor boat, the other larger with a covered area. Had we kept moving all day, it would have been fine but we weren’t dressed for standing in the rain. Our remaining 6 days weren’t as perfect as the start, but we still considered ourselves to have been exceptionally fortunate and know not to expect a repeat next year. We were delighted by how well our bodies coped with the step-up from almost no exercise for 6 weeks to immediately knocking out a 100 mile week, and then another, and almost a third. We did our first and until this event, only 100 mile week, last year on the Coast Path. None of the 3 were planned; they were a consequence of the infrastructure challenges of the through route, particularly food availability. Bill plans and books the entire itinerary months in advance because accommodations are relatively scarce. Ten to 15 miles a day are his rough starting point, knowing that we can do 20 milers but the time pressure of the longer days is a burden with daily hiking. He knows what he wants; then there is what we can have. But accommodations aren’t ever booked until a nearby food market is located. The low tides were dramatic. Unfortunately, our suitcases were right at the 50 lb limit of the luggage transfer service, so we couldn’t load up with low perishability staples like fresh fine beans, tuna, cheeses, and chocolate. We had to "buy-as-we go” and add the weight to our day packs. But our experience and our willingness to push the edges paid off. At one isolated, poorly stocked market, I found a single bag of frozen green beans. I cooked half the bag for dinner, bundled the other half in our puff jackets to keep them cool overnight, then cooked them in the morning to mix in with tuna and cheese to eat cold for lunch. We know not to complain and were pleased to not be eating candy bars for lunch like trail mates were likely doing. Some walkers rely upon walking inland every day to local pubs for lunch that are some times within reach, but we enjoy our year-round, daily picnic of our own food. And we could buy dinner every night at a pub, but the sometimes late serving times, less wholesome food, and slow turn-around time have us wedded to eating our own meals while we bath and ready ourselves for the next day. So Bill’s trip planning task, like when in the Dolomites, was “Where can we sleep?” and then "Where can we shop?” We often joked about being modern hunter-gatherers. Predictably, getting enough groceries each day was a near thing and we lowered our standards and expectations more than once to make the itinerary work. When the offerings were meager, Bill would recall fretting about the decisions he'd made in trip planning and hoped it would work out. Clearly, he couldn’t have pushed the edges much harder than he did. Some days were labeled as “2 dinners/2 lunches” which meant that when we came to the 1 market for the next 2 days, we would have to buy all that we needed for the next 48 hours, except for breakfast, and carry it the rest of the day. Hence the 100 mile weeks were needed just to keep the stream of food flowing. 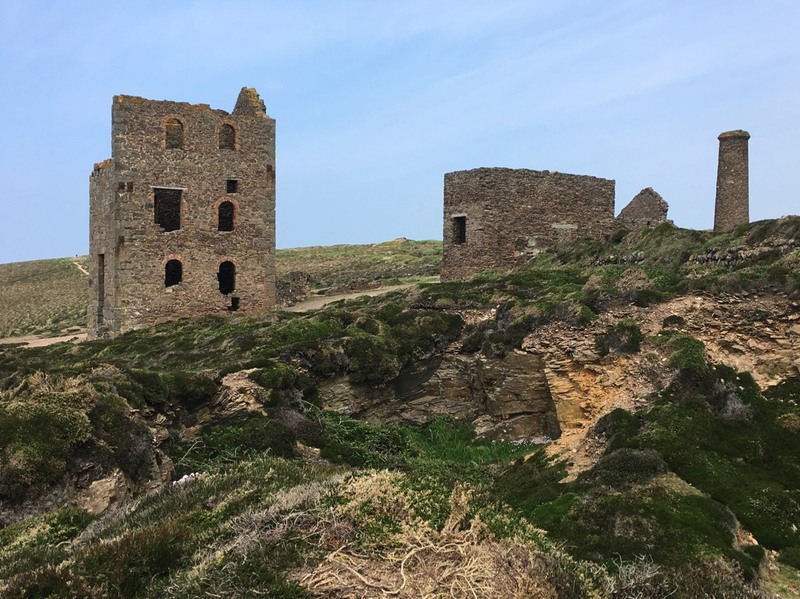 Remnants of the 1800’s tin industry were scattered throughout Cornwall. An interesting measure of our changing needs in the face of abruptly higher output was our total food intake. Last year when on the Coast Path for 11 days, we were ravenous. We ate 2 breakfasts every day: we started with our usual keto breakfast of cheese, nuts, and an avocado when available, and then we ate our hosts’ cooked English breakfast. Even with that, we were losing weight so rapidly that our pants were sliding off of our hips. in 2017, we settled into eating the high saturated fat portion of the Full English Breakfast, which is sausage, back bacon, and eggs along with the sautéed mushrooms and grilled tomatoes, for the extra calories. “It’s only for a few weeks” was our retort when our minds balked at deviating from our carefully selected, meat-free, diet. We did the same this year, skipping the delicious grilled tomatoes in deference to our night-shade-family-sensitive finger arthritis and again passed on the sugary baked beans and toast but loaded up on the fatty items. In 2018, we started off eating 2 breakfasts every day but quickly let our own self-catered meal drop away. We just didn’t need the extra calories. The pants started get baggy, but not as much as before. Our only guess was that even though we hadn’t done a 100 mile week for a year, that our harder winter training had made us more efficient so that we could do the same miles using fewer calories than in 2017. Perhaps it was changes to those amazing mitochondria that are loving our keto diet. About the last 2 days of the event however, I knew that I was accumulating a calorie deficit that had to be addressed. The English breakfast portion sizes were getting smaller and avocados for our lunches were unavailable. I thought the downturn in our intake would nicely coincide with ending our hike, but I was wrong. On our 4th traveling day after completing our walk, I made 3 trips to the Bolzano, IT hotel’s breakfast buffet, still gorging on bacon and eggs, forbidden foods for most of my life. Our friends Des & Penny hiked a half day with us. I’d had a pretty steady diet of 40+ mile hiking weeks with nearly weekly 20 milers over the winter though Bill hiked less because of a leg injury. After we left the SW about April 1, the regular hikes all but went away. There were a couple of 20-something weeks and then nothing for me for a month. Bill got one hike in and we did 1 bike ride while at home, and that was it. I used our vertical climber for 30” a pop some days. In hindsight, perhaps it had been well needed rest, but if we hadn’t done so well when we abruptly stepped it upon England, it would have been labeled as reckless, excessive de-conditioning. Being able to go from being essentially sedentary for weeks and then crank-out an epic 200 miles in 2 weeks was a stunning affirmation that our new focus on creating durability was working. 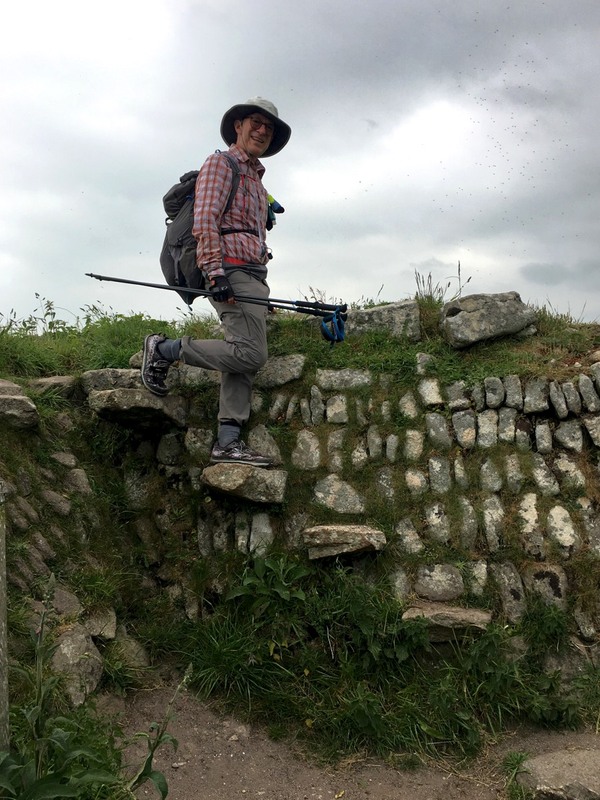 Quite amazingly, some mix of excellent interventions from our bodyworkers at home, luck, and intention on our part resulted our bodies emerging from this intense 20 days of walking better at the end than they were at the beginning. Who would have guessed we could do it unscathed and in a therapeutic way? Bill started that first 100 mile week (though he hadn’t tabulated it in advance) still fretting about his “tib-fib” or his tibular-fibular subluxation (a bit of twisting between the 2 lower leg bones) that masqueraded as a knee injury when he stumbled and collapsed on a mountain trail back in January. He diligently massaged and stretched the many involved muscles each morning in England, noting improvements and setbacks, and stepping carefully on the irritating descents. Still presuming he wouldn’t be up to snuff for doing the via ferratas in the Dolomites a month later, he had no choice but to press on with his self care. Fortunately, between his tissue work and experimenting with taping one of the 2 joints, he transitioned to being pleased with his tib-fib progress by the end of the second 100 mile week. It had responded well to this “go out and use it hard” stage of his therapy. And the morning after hiking day 20, he was extremely pleased: it was the best it had been in 4 months. It would fully recover, he would be able to do whatever he wanted to do with it. It would likely need TLC in the form of massage and stretching for the rest of the summer, but it should perform flawlessly on the trails. 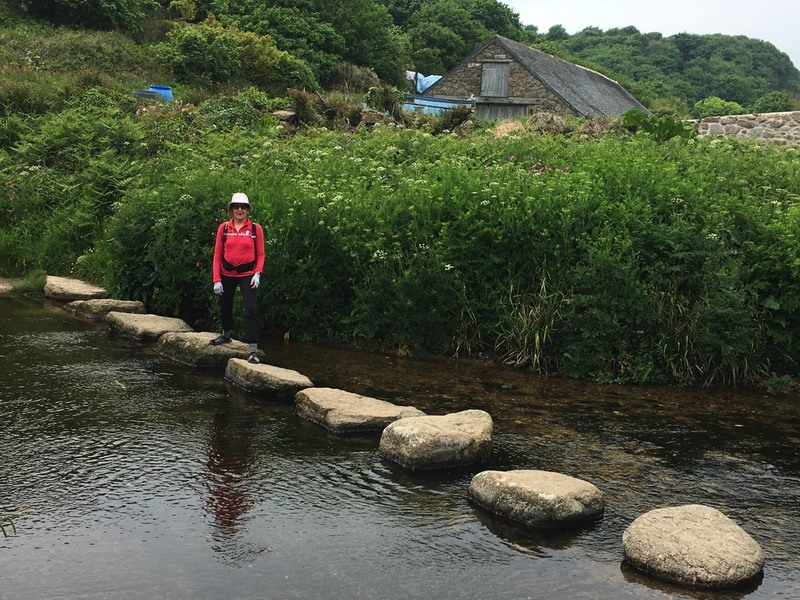 The grandest stepping stones on this year’s route. My body issues tend to be more chronic; they are usually the next chapter in a long, tangled story. But I too was very pleased with my body’s capacity and durability. The latest version of my “peeling the onion” of old dysfunctional patterns was an angry tug-of-war on my right side between my low back, buttock muscles, and inner thigh. Separate but sometimes rolled into the mix, was pain in my right knee. Fortunately, I knew well that the knee problem wasn’t in the joint itself, but in a hip muscle (TFL) that lives among the warring neighbors. One bodyworker answered one of my questions in May by saying “You’ll eventually figure it out, you always do.” I was surprised but realized she is right. With guidance from several bodyworkers each time while at home, I go off on another journey applying their insights. And I generally, mostly, figure-out what I need for the next phase of my healing while on the road. 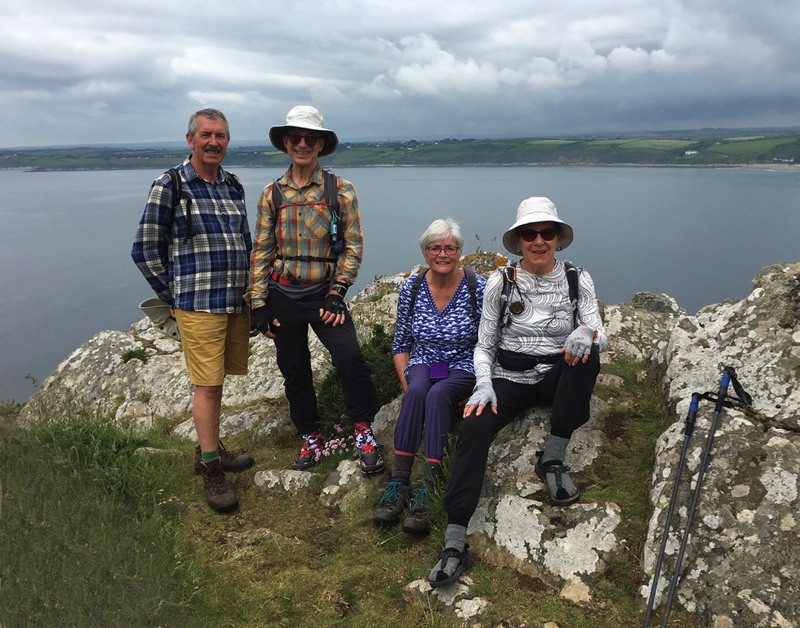 I couldn’t do it without them, but I’m learning that I also benefit if I approach the latest problem with confidence, and that’s what I did while on the Coast Path. I was pleased to develop new remedies to keep myself going on long days, even when near-crippling muscle spasms ramped up. One day Bill checked for bail-out points on the distance main road where we could possibly catch a bus, and I worked and worked to keep myself moving. By persisting, I emerged with a much better understanding of the issues and we didn’t have to take a bus. We will return in 2019 to finish the last 180 miles or so of the SW Coast Path, heading north from Plymouth. We’ll have our tick spray in hand and we have already put our English friends on notice to expect to see us on the trail. We’ll of course use the luggage service again and will reapply ourselves to trim the weight on our luggage—something we thought we had done this year. Bill is hoping to build-in one day a week off the trail for museum sightseeing next time. Unfortunately the top sight for us to see his year, a massive tin mine site, was too far from food markets. We’d had to carry even more food than we did to layover a day. But he is even more motivated this time around, so we’ll see how it comes together. We had 4 travel days to leave Plymouth and arrive in the Italian Alps, with a half days each by bus, plane, train, and lastly, bus again. More ‘hunter-gathering’ to stay fed while we took rest days in mass transportation mode. We’d then spend 5 weeks in the Dolomites at 4 different villages before picking up our bikes for 6 weeks of cyclotouring and hiking in Italy, Austria, and Slovenia.